Lookie! Here's sock #1 of the pair I'm knitting up from the yarn I dyed at the end of September. 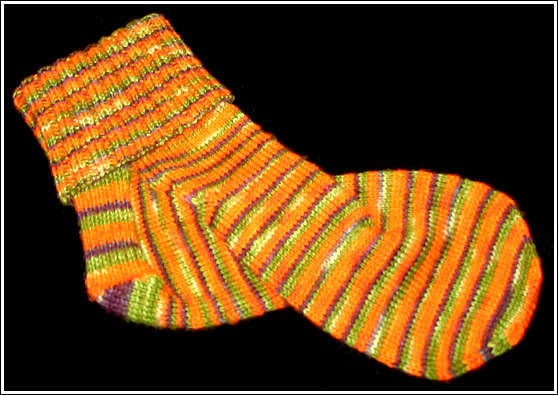 :D They are my Midnight in the Pumpkin Patch Socks and were supposed to be done for Socktoberfest, but that didn't happen the way I planned. Okay I better go finish getting ready for my little road trip in a bit. Wheeeeeeeeee! How cool. It looks so great, your dyed yarn. I can imagine how excited yo uare. How is this one sock at a tme thing working for you? I HAVE to do both at the same time, or there would be no second sock. Going again? When are you going to be HERE??? Nice sock! You will be all set for next Halloween. Squidly hugs!!! Nice dye job. And no roots! Look at you!!! Your own dye job and look how marvelous your sock looks!! Good work.